Due to technical difficulties, blog, Facebook and Twitter posts will be extremely limited until these are resolved. I will try to check in when I can but time and access will be limited. Needless to say, this will also effect our hour other pages will also be on hiatus. Pages syndicated to Facebook - OPFTA, Workplace, Changing Universities, and CFHE - will not be affected. Please send suggestions for additional subscriptions. Closing reminders: don't forget Labor Day next Monday, September 2. World Teavechers Day is October 5 ~ over a month away but still not too early to starting planning or to share your event with the world. 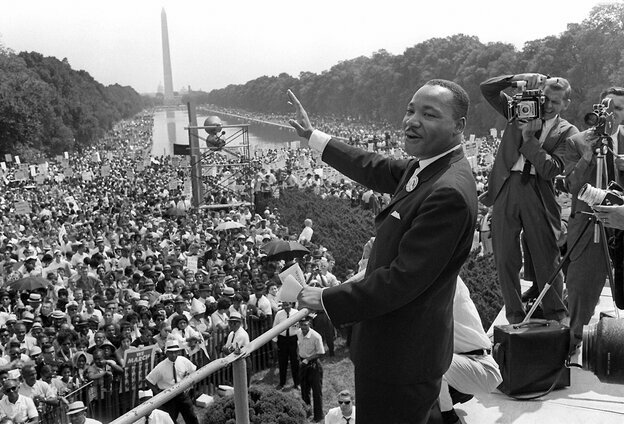 Today is the 50th Anniversary of the March on Washington. Tomorrow is a Nationwide Fast-Food Workers Strike. Both events share goals with and hold great significance for our own mission. What does a theory of change look like? …Change…we have different ideas about it (often so strongly held as to become more obstacle than motivation), what it is, how to achieve it…but whatever it is and by whatever means, we want it. I had the notion of writing about hours and spent more that a few pulling material and making notes by the time this article caught and held my attention. The piece, instead of jelling, was turning into The Blob. I needed a change. So do adjunct working conditions. Firstly it’s ‘theories’ not ‘theory’. When people talk about a single ‘theory of change’ (ToC from now on), alarm bells should ring – in the worst case it’s just a new jargon for old-school linear change, impact chains, logframes etc. Instead of a deluded search for a single grand theory of everything, we need to learn to recognize and manage a range of theories, throw them at a problem, and see which ones are helpful (see my recent experience of doing this in Tanzania). …@InsideHigherEd article notes administrators, admin oriented organizations, accreditors, ACE, even for-profits had a say. By stark and, frankly, shameful contrast, students, families, in the classroom educators, even HE unions were either not heard from or their input went without notice. Were we invited? Our input solicited? Did anyone on the above list (higher ed media included) notice our absence? It's too late now: the deadline for input was August 2. Even the IRS treated adjunct faculty with more respect.